We have invited a French collegue to our collective cooking. 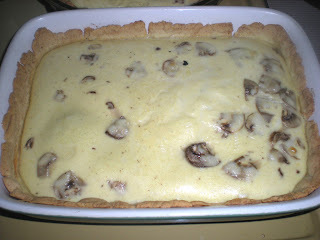 He was assigned to work on the main dish and he made Quiche Lorraine. I made my version of Quiche Lorraine in January. Here is his version. 1. Preheat oven at 400F. 2. Cook onion over medium-high heat until transparent. 3. Beat eggs in a medium bowl. Blend in crème fraîche and milk. Add ham, onion, mushrooms, nutmeg, salt and pepper. 4. Lay pastry dough on a baking dish or a 8-inch tart pan. With fork, prick dough all over. 5. 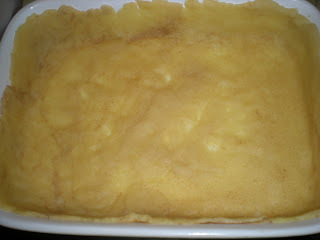 Pour batter and top with grated cheese. 6. Bake for 20-30 mins or until golden. Thanks Rebecca. Not only that, you can easily save a lot of money as some of my collegues are on a budget. What a grand quiche. I'm ready to eat ... oh! cook! Loving the filling.